Bay Area Recording Artist Priscilla G Releases New Mixtape "707 Gang"
Coast 2 Coast Mixtapes announces the release of the latest mixtape by Priscilla G currently seeking blog placements and interviews. Today Coast 2 Coast Mixtapes announce the release of “707 Gang”, the latest mixtape by Bay Area recording artist Priscilla G. The mixtape is currently available for streaming and download at the Coast 2 Coast Mixtapes website. 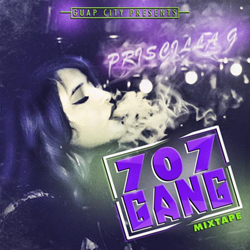 "707 Gang" is the first volume of Priscilla G's collaboration with the 707 Bay Area's Guap City Records. It feature a few remixes including Drake's "Right Hand" and a freestyle to "Energy" as well as some original tracks and a snippet of Priscilla G's newest single "Nothing". The video for "Nothing" will also be debuting this month. This mixtape was put together by Priscilla G and Keeloz of Guap City who is an artist, producer, and engineer. This is Keeloz's 2nd time around working on a mixtape with Priscilla G as he also presented her debut mixtape "She is Priscilla G" last year. This mixtape was also mixed by Guap City's Dj Rock Right. Priscilla G is currently seeking press opportunities, interviews, features, and more. She can be reached through her official Twitter page. About Priscilla G: Priscilla G is a singer, songwriter, rapper. Born and raised in Northern California and the Bay area. She is best known for her singles "Freak in you", "Work it out", and "I'm so Lucky" which all received major radio play in 2013-2014. She debuted her first mixtape "She is Priscilla G" hosted by bay area's legendary radio host Chuy Gomez with Coast 2 Coast last year after winning 1st place with Coast 2 Coast's Bay area competition. She then went on and received blog placements for the mixtape as well as her video "Rotate" with Young California and LA's Power 106 Dj Carisma's website. This year she emerges with her mixtape "707 Gang" presented by Guap City records and plans on following with the release of her highly anticipated EP coming in February. For all the latest music by Priscilla G, be sure to check out here official Soundcloud page.